Hi folks first of all let me say what a great site this is it's my go to place for info. In early November I built a pond 440 gal plus observation tower. I run an all in one filter (biological plus UV which feeds a bell fountain/waterfall at 550 gal per hour). I let it run for 2 weeks and then added 2 2" petshop goldfish to get things started in mid December I added 10 3" pond goldfish everything seemed to be ok until last week when one of my petshop goldfish seemed to be swimming listlessly. My first thoughts were swim bladder but the fish have never been fed and if he stops swimming he ends up upright head to the sky! I checked the water parameters ammonia 0.2, nitrite 0.25 kh is low at 50ppm which I rectify by adding backing soda at every 10% water change I do ( twice a week) the pH is 7 but the general hardness is soft our water is soft in the northwest on England. I have given him two mild salt baths of 3 mins but they don't seem to of down out intact he's more listless now and stay mainly on the bottom. Thanks for the positive feedback. We try to provide useful information for the enthusiast. You live in the North of England. From my last visit, I would expect December to be reasonably chilly, therefore the water will also be quite cold. 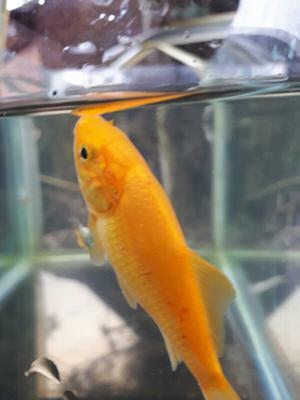 As you have a large filter, (excellent choice), the bio-load of two 2" Goldfish would hardly have built up a large beneficial bacterial colony. You then increased the bio-load by 750% by introducing the 10 3" fish. The filter would take some time to build up sufficient bacteria for the larger population. Cold water would slow the process even further. There may have been an ammonia spike which stressed the fish. I conclude this because you still have ammonia and nitrite readings. If the filter was biologically healthy, these should both be zero by now. Because you introduced more fish into the pond, and if you didn't quarantine them, they could have introduced a pathogen that your first two fish didn't have. The other possibility is that they were already carrying something but with only two fish in the pond, they weren't stressed. My conclusion is your filter still isn't functioning at the appropriate level. Add something like API Stress Zyme to accelerate the process. Make bigger water changes in the short term, say 20%. The fish obviously has some pathogen. Were those red spots on the caudal peduncle? I suspect parasites, either flukes or a protozoan parasite such as Costia. Get the fish back into a salt bath and leave it in the solution. If the problem is Costia, a tablespoon of un-iodised salt per gallon is required, but I would bring the strength up very slowly. I would have thought the water was too cold for Costia, but the temperature may have slowed its spread. If its flukes, salt won't kill them. You need a Praziquantel base medication that will actually kill both parasites, plus any internal ones. You need to act quickly because whichever it is, it's affecting the gills, hence the upwards swimming motion. P.S. you need to feed that many fish in a relatively small pond. Hunger will also stress fish. 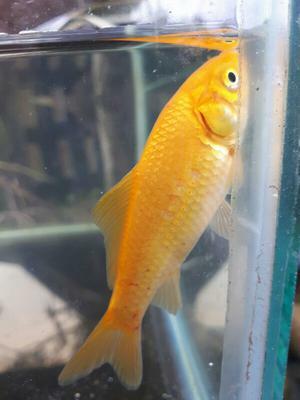 Comments for Sick Goldfish Help! I was a little concerned when I saw the photo. Common Goldfish don't really get swim bladder problems. I think it was something else that caused his death. Anon's comments about chilling is valid though, especially since your water temps are quite cold, and Edmund was quite small. You are correct about the feeding. At 37F they will show little or no interest in feeding. effectively. Some Goldfish keepers in colder climates shut down their systems over winter so their fish don't use fat reserves swimming against a current. In my experience chilled fish sometimes develop swim bladder problems due to a sudden temperature shift. If an indoor fish suddenly became an outdoor fish that might be a big enough change to cause the kind of swim bladder disregulation you were seeing. A fish that is unable to stabilize their position in the water column is having swim bladder problems whatever the reason, IMHO, and will have trouble eating, resting, etc. until it is healed. A smaller tank, maybe a touch warmer & calmer water, salt, isolation, hand feeding all will increase the speed & chances of healing. What is it about goldfish? All those generations of selective breeding have given them ticky bladder valves? Or the rough and tumble cold water lives they live (and the water they create) expose them to more risky situations? Seems like every friend I have w goldfish has one that's like a gouty old gentleman that needs constant monitoring of his bladder condition, harrrumph harrrumph. Hi grant thanks for the info,sadly I lost little Edmund(the fish), however determined not to lose anymore. In my filter I've been using pure pond bacteria gel to boost the numbers, I've also bought a second biological pressurised filter and bought a air pump at 45lt per min to aid the production of good bacteria, none of the other fish are showing any signs spending most of their times hidden under a false marginal shelf, you mentioned feeding them? I've checked the water temperature and it's 37.3 f and it's not been above 50f this year,i was under the impression you shouldn't feed fish at temperatures below 50 is this correct? They are not showing any signs of wanting to be fed?